The “Best New Address on 30A” is still in the early stages of development, however, the beauty of RidgeWalk has already come to life. The first Calais B model home nearing completion in August! As the RidgeWalk community continues to grow, two new floorplans have been introduced. 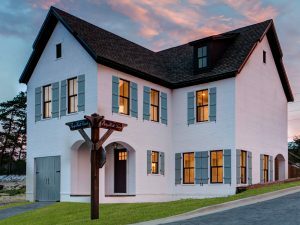 The first is The Monaco, a two story, 2,368 square foot, four-bedroom, with three and a half bathroom home, in addition to The Normandy, a two story, 2,177 square foot, three-bedroom, with two and a half bathroom home. RidgeWalk offers a relaxed bechside lifestyle, unmatched by any other community on 30A. As construction continues, the dream of owning your own vacation retreat along the beaches of South Walton becomes a reality.